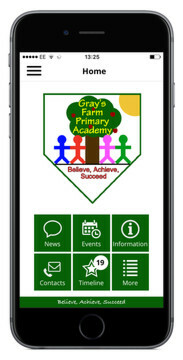 Gray’s Farm Primary Academy has a new mobile app! It is designed to keep you well informed about your child's education and life in general at school, and to help cut down on paper and ink consumption. We will post school news, events, curriculum information, contact details etc., we will also use it to send important messages. So whether you are out and about with your phone, or at home with access to a tablet, you will always have a quick and convenient way to find key information or simply browse. We hope that you find the app useful and easy to use and would love to hear any feedback that you have. 2. 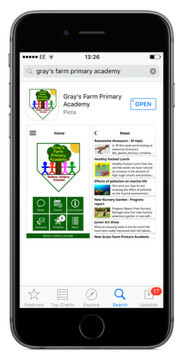 Or visit the Apple app store or Google Play on your device and search for "Gray’s Farm Primary Academy ". Please leave the Urgent alerts category turned on. This is for urgent and whole school messages that everyone needs to see. 2. 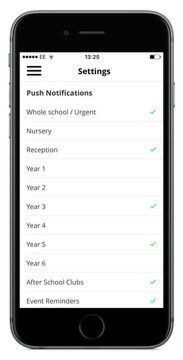 The “Timeline” tile contains a record of the alert messages you have been sent by the school. The circular counter on the app shows how many unread messages you have. 4. You can find a more detailed guide to navigating the app in the “Information” section of the app itself.